Give your skin an immediate line-smoothing matte finish and fight signs of aging caused by the sun with this Farm to Face sourced, antioxidant-infused, broad spectrum SPF 30 mineral sunscreen. This unscented and lightly tinted formula is made with natural Rose Hip Oil which is rich in free radical fighting Vitamin C. Naturally calming Evening Primrose and Flax Seed Oils deliver abundant Omega-3 and Gamma-Linolenic Acid to improve elasticity and help skin retain moisture. Natural Shea Butter smoothes and hydrates while the phyto-protector Plankton Extract rejuvenates skin. Formulated for all skin types and tones, including those that are especially sensitive or oily. Product goes on very smooth and almost acts as a primer if putting makeup over top. Didnâ€™t really notice a tint but it also didnâ€™t give a white cast like other sunscreens I have used. Wish it came in a higher spf. I really love this sunscreen. It is very lightweight, it goes on matte, I can wear it alone or with foundation, it doesn't cause my acne-prone skin to break out, and it protects my very fair skin from sunburns. Unlike other mineral sunscreens, it is not thick, greasy, and white. Oh my goodness - this sunscreen is my new favourite! I love the texture, it is so smooth, goes on almost like a primer, and the slight tint essentially just makes sure that you don't end up with white streaks on your face. It is perfect for under make up and has not bothered my reactive/acne prone skin! I love how matte this physical sunscreen is! Most other physical sunscreens have the consistency of diaper rash cream and the gleam of a gallon of olive oil, but this one is definitely far from that! Dead matte. It blends so perfectly into my skin and the tint is just enough not to leave a white cast. The tint doesn't actually impart any coverage which is great for those of us who don't want to wear foundation. My freckles show through! I also love that it's FRAGRANCE-FREE. Basically, it checks off all the criteria on my list for what I'm looking for in a facial sunscreen. If this ever stops being manufactured, I'm not sure what I would do. This is a great non-greasy sunscreen with a nice consistency. Best of all, it does not leave a white cast like most mineral sunscreens (I have medium-tan skin)! I have been using it for a few weeks now, and it has not aggravated my acne-prone skin. The colour is very sheer, so it would probably be good for all skin tones. I love how light this product is - it feels weighless on your skin. And it looks great under some powder as well. Super happy with it. Definitely better than the one that isn't tinted. Both are good - this is better. I love it! It has a light and silky texture, glides on smoothly and is non-scented but unfortunately very little to no coverage. I recommend shaking the product first and applying it on top of your favorite moisturizer. I love Coola products but this one is not my favorite. It is silky to the touch but doesn't give any coverage. I like the SPF in it, but I have to use another moisturizer under, otherwise it dries my normal / combination skin. This is my go-to face cream for summer. It's light and leaves my skin slightly tinted and matte. I've been using it for a few years now. I have sensitive skin, and I appreciate that it comes in an unscented version so that it doesn't irritate my skin. Love how incredibly silky it is! The only downside is that it seems a bit drying or leaves a slight white residue occasionally. The texture of this sunscreen reminds me of Benefit Porefessional. It feels lovely going on. It's very silky. The tint isn't obvious at all and mostly just cancels out the white cast. I took off one star only because if you are prone to breaking out, this doesn't help. It doesn't make me break out really badly but just like Benefit Porefessional it's best suited to skin that doesn't break out too easily. 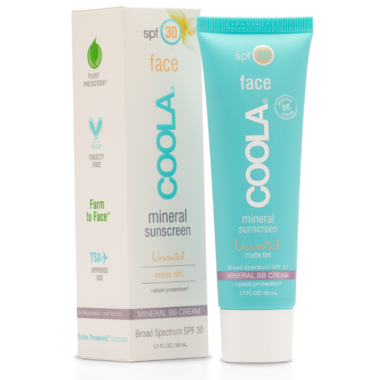 I've been using Coola's tinted mineral sunscreen for about a year now and still really like it. The non-tinted one is great, too, especially under make-up. No animal testing, either. Woo hoo! Coola makes wonderful products - I've used a variety and have not been disappointed. This matte is nice and the tint is light and not too heavy. Goes on very smoothly. J'aime les crÃ¨mes solaires de Coola. J'aime la texture et l'odeur douce. J'ai essayÃ© celle-ci 2 fois et Ã§a se passe bien jusqu'Ã prÃ©sent. This product is incredibly matte, and layers well over my moisturizer and under my BB cream. Its now my go-to daily SPF. Its pricy, but it only requires a small dab per use so this tube will last months. I will buy again. I'm so happy that well.ca started selling coola. This is the best sunscreen ever. I have rosacea and absolutely love this sunscreen. It calms my skin and never makes me break out. It also has such a gorgeous matte finish that lasts all day long (I never need powder or foundation anymore). I hope they never stop making this stuff because it's wonderful!